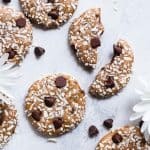 Just letting you know that these soft and CHEWY coconut protein cookies with almond butter are sponsored by my friends at ALDI! 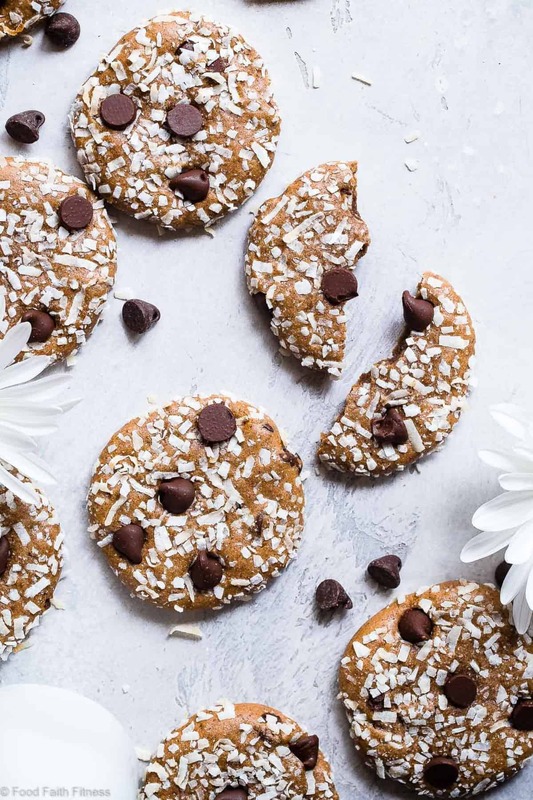 This protein cookie recipe uses almond butter to make them extra soft and chewy! You will never know these are gluten free and healthy! Yep. You’re reading that right. The BEST texture that your cookie-loving-mouth could ever DREAM of munching. 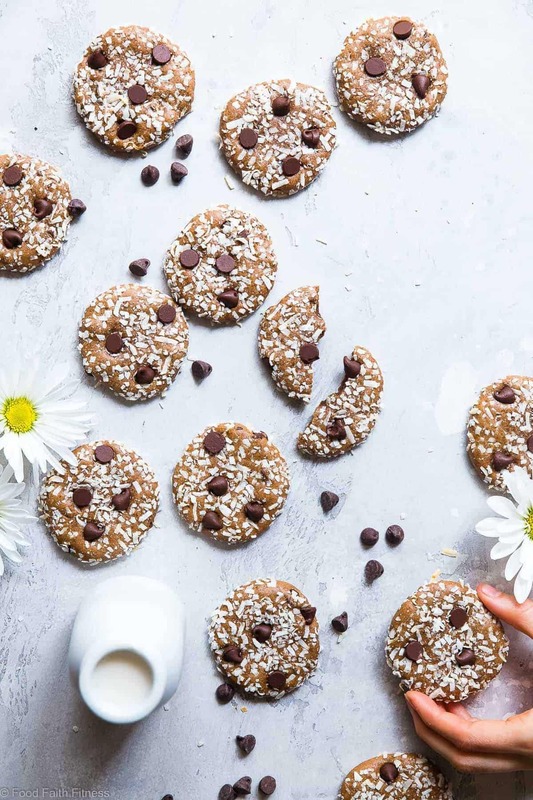 Liiiike, think of eating both a pillow AND a cloud at the same time (studded with little gems of OOEY GOOEY melty chocolate) and that is what eating this protein powder cookie recipe is like. Except without having to get feathers or foam or anything else awkward that would happen if you ate a real pillow. Internet friends. There is ZERO percent chance of you messing these up. YOU CAN DO THIS. Why yes, that does mean that you can have your cookies right after your workout and feel VERY SOLID and 100% about the choices that you make in your real-person life. Not just any protein powder though. 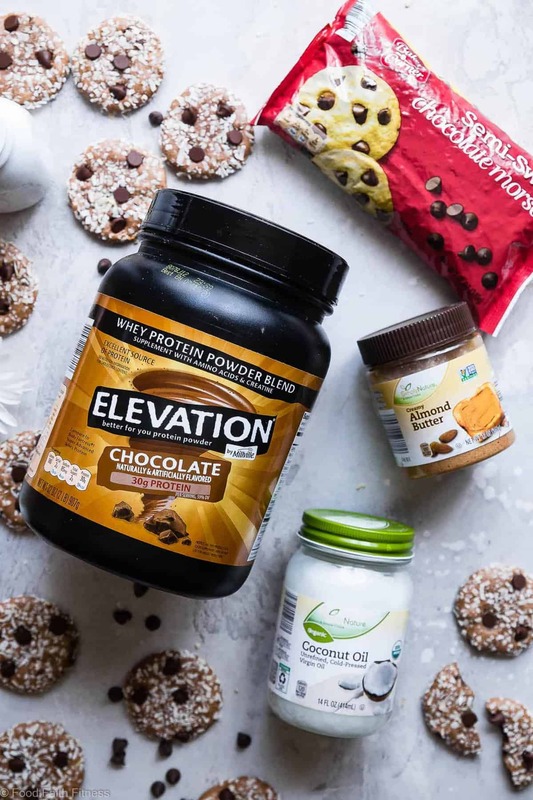 The protein-packed ingredient in question is Elevation by Millville Chocolate Protein Powder sold at ALDI, which is SO good that it won AN AWARD. This perfectly-sweet, yet rich and INDULGENT (but gluten free and healthy!) protein powder was voted the Best New Protein Powder by Consumers,* and no other brand won more awards than ALDI in the BrandSpark American Shopper Survey! I’m about 99% confident that you already know about ALDI. But, just in case you are not “IN THE KNOW,” ALDI has amazing, high-quality groceries at prices that you are gonna L-O-V-E. They have everything for whatever diet you follow, and it’s all fresh and just so awesome. <– I do A LOT of grocery shopping for all the recipes I make, so all of this is KEY. Soooo, protein. You know where to get it. You are now IN THE KNOW. Because chocolate happens to be VRY VRY tasty with coconut and almond (hi homemade paleo almond joy bars and salted “almond joy” no bake bars) my inner wise person told me that creamy-DREAMY spirals of almond butter and a sprinkling of coconut on top was the RIGHT MOVE for these whey protein cookies. When the end game is T-H-E-S-E, there is no wasting time for the nonsense that is real pants. You are going to come back and only dirty ONE bowl on your quest for muscle-building treats. Optional step if you have children or a husband (or wife! ): make them wash said one bowl because you are a QUEEN (or KING) and should not have to do such things. Sit in front of the oven and watch the cookies rise, impatiently waiting. Realize that you STILL have to wait for them to COOL COMPLETELY on the pan. Possibly have angry words for Taylor. Put on your big girl pants (these have pants-approval status) and wait. 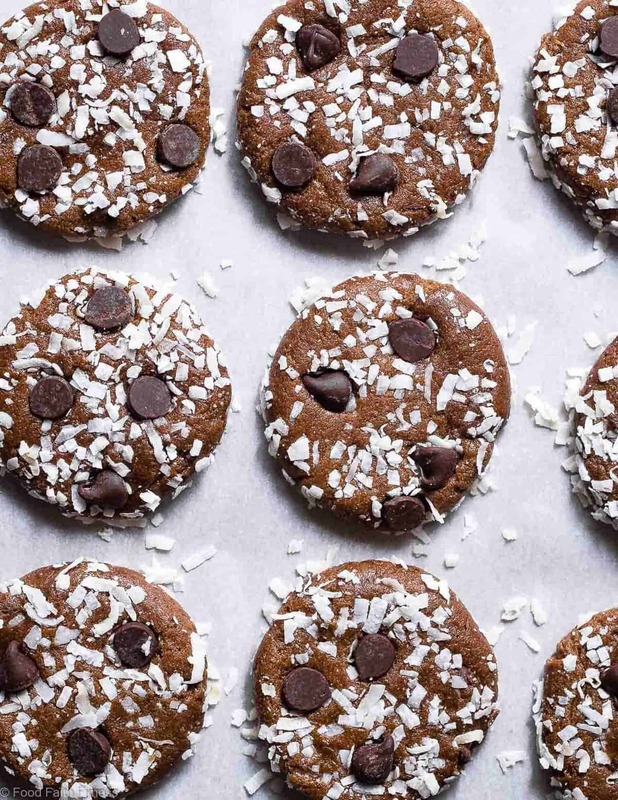 Coconut protein cookies are the post workout treat that you never knew you needed. 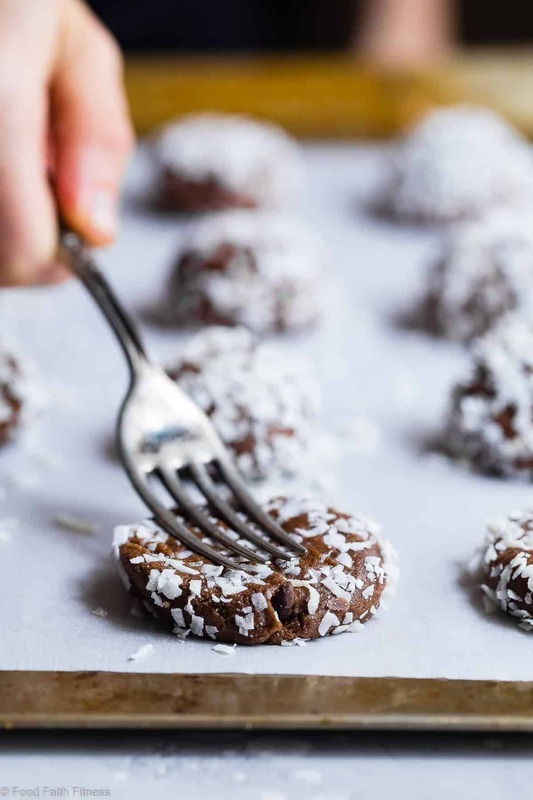 These chocolate coconut protein cookies use almond butter to make them extra soft and chewy! You will never know these are gluten free and healthy! Preheat your oven to 325 degrees and line a baking sheet with parchment paper or a silicone baking mat. Place the almond butter in a large, microwave-safe bowl. Microwave until smooth and melted, about 1 min and 30 seconds. Add in the protein powder, cornstarch, cocoa powder and a pinch of salt and stir until smooth and sticky. Your batter will be a little thinner than usual cookie dough. Stir in 2 Tbsp of the chocolate chips. Place into the freezer for 10 minutes to make the dough easier to work with. Spread the coconut flakes on a shallow, sided plate. 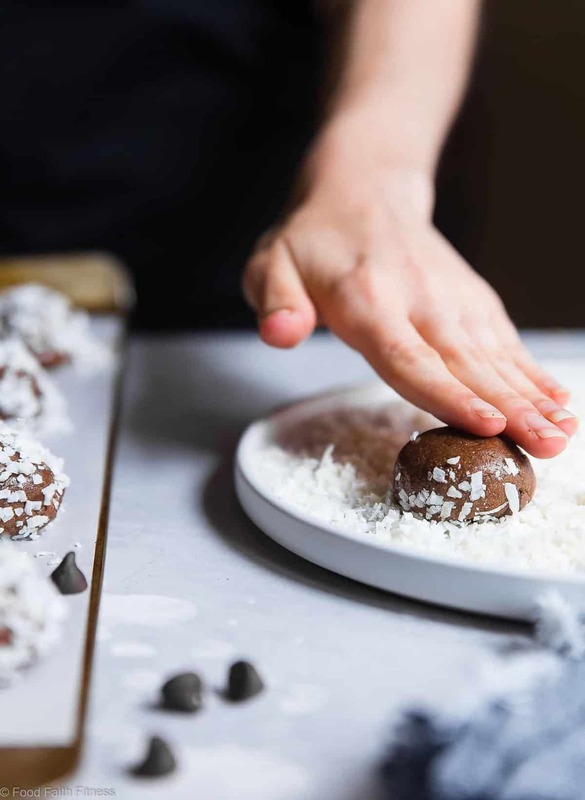 Remove the cookie dough from the freezer and roll into 14, 1 Tbsp sized balls. Roll just the tops and sides of each ball in the coconut flakes and place onto the prepared pan. Flatten the cookies about 1/3 inch thick and press in the remaining 1 Tbsp of chips. Freeze again for 25-30 minutes, until they feel hard. Bake until the tops JUST feel set, about 11-13 minutes (they firm up a lot once cool.) Let them cool on the pan COMPLETELY. *I know this sounds strange to add the eggs separately, but this is how you get a great texture. When I tested adding them at the same time, the cookies were much more cakey. THIS POST IS SPONSORED BY MY FRIENDS AT ALDI. THANK YOU FOR ALLOWING ME TO CONTINUE CREATING GREAT CONTENT FOR YOU BY SUPPORTING PARTNERSHIPS WITH SUPER-FAB BRANDS THAT FOOD FAITH FITNESS LOVES TO WORK WITH! AS ALWAYS, OPINIONS REMAIN 100% MY OWN! What delicious looking cookies! My whole family will love these… I just won’t tell them that they are healthy. Pinning! Yay! Thank you for the pin too Meredith! I love coconut and chocolate together! These cookies look amazing! Oh my goodness, these cookies are adorable and they sound amazing! Pinning now so I can make this later! I totally hope you love them Marlynn! Coconut and almond go so well together. These look like some delicious cookies! They totally do – such a tasty combo! Thanks Danielle! These protein cookies are delicious!! Thanks you so much Cindy! Aren’t they so good?! That was the point! 😉 Love those flavors! What a delicious way to get more protein! So glad you think so Barbara! My kids are always hungry after school. I am totally making them these! Love that they have the added protein. Love this idea and definitely want to make this my post-workout snack! Yummy! The texture of these looks perfect. I love anything chocolate, almond, coconut too so these are right up my alley. They’re SO dense and chewy! You will love them! Post workout cookies? Yup, I can get on board with that for sure! These look super yummy! To be honest, I’ve never put protein powder in my cookies, but now I’m wondering, WHY!? These look amazing, Taylor! Girl, you HAVE TO! So delicious! These look so delicious! Such a great post workout treat! It sounds like you used too much protein powder and did you use a different protein powder? Also did you weigh it? All protein powders react VERY differently, which is why you must weigh your ingredients to ensure accurate results. No liquids are missing. Let me know about the two questions above! First of all I have made many many of your recipes, and loved 100% of them, truly!! 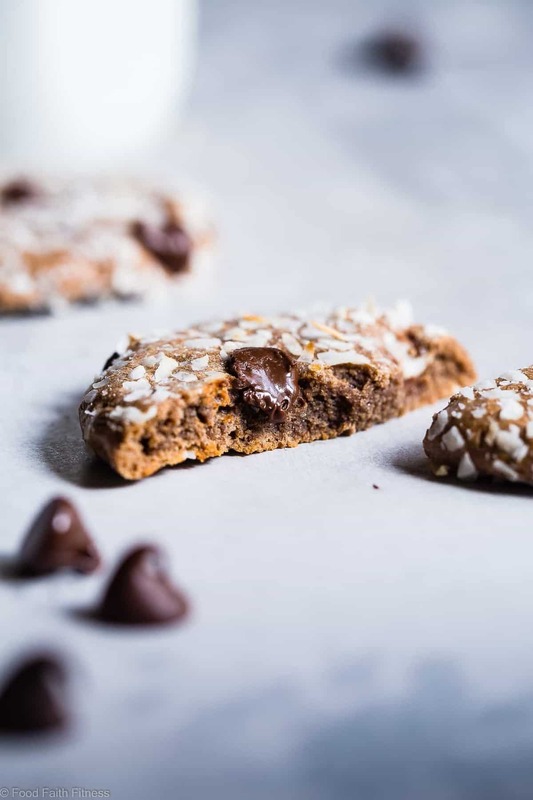 I am getting ready to make this almond coconut protein cookie, and for some reason I can’t seem to see where to add the coconut sugar in? Oh you just made my day! Thank you for letting me know! THANK YOU! Thats a typo – updated the recipe! Yaaaye!! Perfection ! Many thanks! !